A Passion for Creating Beauty! 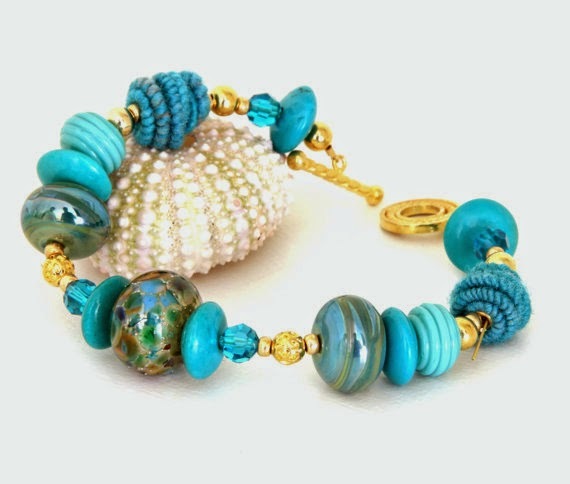 Ten or so years ago, I discovered and began to collect beautiful artisan lampwork beads. In time, the beads took on a life of their own and started coming to me in dreams, showing me how they were meant to be put together into earrings, bracelets and necklaces. I took this as a sign that it was time to ease out of the business of counseling and into the business of making beauty. Working on simple projects where making beauty was the objective (rather than selling or marketing my work), I re-discovered joy, color, fun and, well, whimsy. Beading became a meditation and, in many ways, a spiritual practice. My spirit was lighter, my life filled with more grace, tranquility, peace and serenity. For a long time I worked quietly and privately at developing as an artist. One piece sold here, another there, and soon others were asking about and following my journey from therapist to artist. Not only was I counseling women and men who wanted to make fearless career leaps from stressful workplaces and situations, but I was modeling a leap of faith as well. A decade later, my life as an artist has taken wing. Oh, I still love working with clients, teaching, gardening and all the other ways I make beauty come alive in the world around me. I have a versatile and interesting life. But creating the wearable jewelry art of Wild Woman Beads seems like my destiny, and I am grateful to have found it.